The unique formulation of this liquid shampoo is very effective. It makes the coat very shiny and cleans the pet. The furry small animals become fluffy upon using this shampoo. It gently and thoroughly removes the dirt, faeces ad other organic matter. 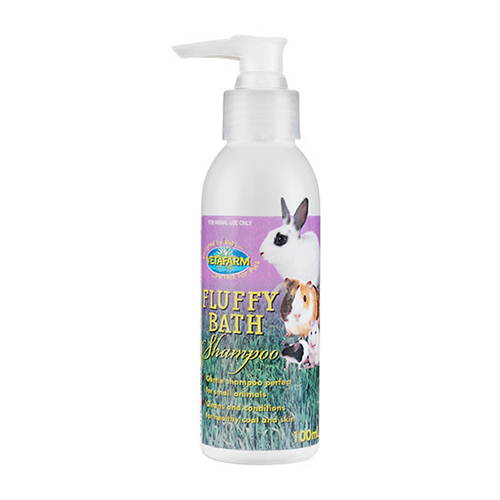 It is a medicated shampoo which is easy to use on the small animals like rabbits, rodents and ferrets even with skin problems. Add 2ml of Fluffy Bath Shampoo to 1L of warm water. Gently immerse animal into the water and gently shampoo the fur. Avoid contact with the eyes and wetting of the pet's ears.